Muzeon Park of Arts (formerly the Park of the Fallen Heroes or Fallen Monument Park) is a park outside the Krymsky Val building in Moscow shared by the modern art division of Tretyakov Gallery and Central House of Artists. It is located between the Park Kultury and the Oktyabrskaya underground stations. It is the largest open-air sculpture museum in Russia, with more than 700 artworks currently on display and another 200 in storage. 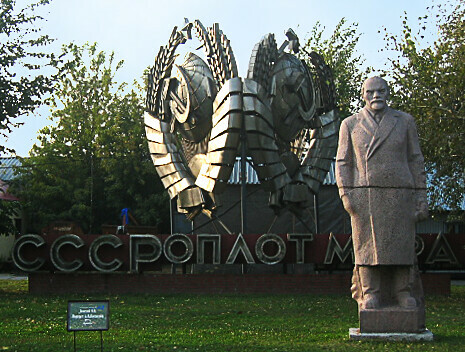 The origins of this expatriate English name are unknown; in Russian, the park is either simply named Sculpture Park of the Central House of Artists (Russian: Парк скульптуры ЦДХ) or referred to by its legal title, Muzeon Park of Arts (Russian: Парк Искусств, Park Iskustv). I would call this place an insider tip besides all the more obvious sights within Moscow. The free of charge park offers a lot of dismantled monuments from different time periods. Not only it is interesting to stroll around and have a look on the likes of Lenin and others, beyond that it gives some insights in the Russian history. One can easily get lost within all the monuments and spend a few hours there. In my opinion, totally recommendable. Worth a visit if you're into contemporary art. Really good sculptures.